Ever wonder why mini cupcakes taste so much better than the standard ones? Or why you fancy teeny-miny cake-pops over a big boring cake? Is it because mini cupcakes and cake-pops are fun and cute deviations from their regular versions? Regular is always dull. Crazy boring. No? That’s why this giant strawberry cookie here is so different. 1000x better than all other dwarf cookies. Also when you can have only one cookie, it has to be giant! Hello! Slim legs. 😉 And when that giant cookie tastes strawberry and is colored Pink, can you help inhaling two at a time? Well I don’t know if you can, I couldn’t (Shameless gal stands here)! I suggest you only bake these cookies when you have someone to share these with you. Else don’t come back complaining, I didn’t warn you earlier! Rest you don’t even need to break out your mixers or any baking tools to whip these cookies. And these come together in less than 25 minutes, start to finish! Takes additional 30 seconds to polish them off! Burp. Excuse me! Can it get any easier than this? Add a little egg, some oil and leavener to some strawberry cake-mix. Whisk it to combine. Freeze for a few minutes, stud with some chocolate chips of choice and bake. And wait for ten until a big fluffy, extra chewy, crinkly, melt in mouth and loaded with strawberry flavor cookie appear in front of you. How do ingredients behave (chemistry wise) in the recipe! Why does everything look so pink to me today? Is it just me? I used both dark and white chocolate chips in the recipe for taste and added appearance. You can top them with absolutely any candy that your heart desires. You can easily press down a few more chocolate chips after they come out of oven for some more added beauty. The chips will melt slightly, as the cookies will be warm. Heavenly! All my Ladies and my Men (if any male reads this! 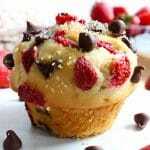 :D) who have never baked before, charm your loved ones with these strawberry cookies. But forget not to bake a minimum of two. Taste test and treat yourself with one and give away the other if you can! I won’t judge if you ate both in one sitting too. Promise! Just look at how thick and puffy this cookie is. Strawberry cake-mix does most of the job for us here. Wait, what did you say? 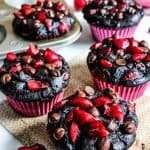 YOU ARE PLANNING TO WAIT TILL VALENTINES TO BAKE THESE!!! Have you lost I get these are pink and all. But why wait for some occasion to bake cookies, when these are so quick to bake and even quicker to finish? 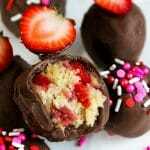 Isn’t it valentine everyday with these giant strawberryyyy treat in both of your hands? One in both? What??? Also, if your eyes are all dyed in pink after goggling at this post here are some non-pink posts for you! Or this baked hit-the-trail granola? You would not put it down when any time can be snack time with this granola in your cupboards! Get ready to experience a giant Strawberry cookie explosion in your mouth with the first bite of this ridiculously sized pink colored cookie! Thick, chewy, fluffy and strawberryyyy yummy! 2. In a mixing bowl put in your cake mix, add oil, baking soda and egg (everything at at room temperature). And mix well with a spoon/spatula to form a dough. 3. The dough will be very sticky at first. But worry not. This will produce the chewiest cookies you will ever taste. Add in dark chocolate chips( save a few for decoration) and freeze for 3-4 minutes or until the dough is firm enough to handle. 4. Take the dough in your hands and make 2 balls. Press this ball on your lined cookie sheet to form a circle as shown in the picture above. Press in a few more chocolate chips(Optional). Bake one cookie at a time. 5. Bake the cookie for 9-10 minutes and check for doneness. Take the cookie out if it has got a pale color on the edges. Else bake for another minute. The cookie will appear soft in the center but will set as it cools down. 6. Take out of oven, let it cool further down on the sheet. This is the perfect time when you can press in a few more chocolate chips for appearance and Hello! Extra chocolate chips. Repeat the process for second cookie. These giant strawberry cookies are famous for catching color quickly. So keep an eye on them. Every oven is different. So, I'd say baby sit them for that gorgeous color. And turn the tray (halfway through) if you see them browning too soon on one side. I don't like how white chocolate chips catch color if pressed in the cookie before baking. Therefore, I decorate my cookies with white chips when they are cooling down. I suggest you do the same. The cookie might appear soft in the center, but it sets well as it cools down. That’s a giant cookie! Looks so pretty and delicious that I wish I could have a bite too! Thanks Angie! I baked this three days back and now I too want to bite into this cookie again! How freakin’ fun are these? I totally know what you mean about treats that are smaller or larger than the norm! And the colour of these is gorgeous!! wow look so elegant and pretty! Pretty sure it tastes yummier and wonderful as it looks ! Sure will do am sure my kids would love it! Gladly saying, my cup of tea ! The grandson and I are trying to eat more “colors” (a way to get some veggies in him). I think he’ll like your colors a lot better than mine! Haha! Strawberry cookie sure is the color of indulgence but nothing beats the colors of daily nutrition! Oh my! Not that these can’t be enjoyed by adults, but boy, would my grand daughter love these! Such a cute and pretty cookie, perfect for Valentine’s day! Isn’t it. And I can’t resist all the strawberry flavor in these cookies either! So glad to hear that. Plus these taste all strawberry and are so easy to whip. I am sure she will adore them. Thanks for stopping by Neil! 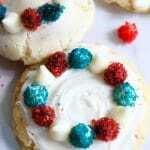 These cookie chips seem like an ultimate party dessert! The color is really appealing! Woah! This looks fun! And I appreciated the chemistry lesson! Ok I’ve never made nor eaten a strawberry cookie and now I’m feeling deprived! I love the addition of the chocolate chips – MMMM everything’s better with chocolate, right! Also, I’m pleased to learn yogurt would make cookies chewier – I’m going to have to noodle on how to incorporate it into a couple recipes myself! Thanks for the recipe! Then your cousins have earned all the rights to these cookies! 😉 Also everyone (irrespective of their age) deserves some touch of pink in their lives. Hope you get to try these. Can we make these few days ahead. Thanks for the awesome recipe. They turned out really good. I made them heart shaped for Valentine’s. I love monster cookies! Never thought cookies can be made in strawberry flavor too! This is going to be definitely on my baking list. I am already drooling!!! This looks so great; I can’t wait to try it! Everyone in my family loves strawberry cake! 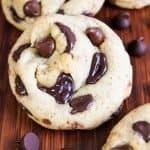 Any tips on baking a cookie cake made from pre-made rolled dough? My daughter has asked for one for her birthday and instead of ordering, I decided to make it myself. Thanks Kelly! I’ve never tried a cookie cake with cake mixes, sound so convenient. But I’d suggest you to bake one from scratch. It doesn’t take much time and you can control the amount of sugar that goes in. As pre mixes are way too sugary for cookie cakes. Happy birthday in advance to your daughter! So is it baking soda or powder? Ingredients say one & directions say the other? Thanks for catching that Cheryl, just corrected. You can use both. Baking powder, you will need 1/2 tsp. If using baking soda, use 1/4 tsp. Happy Baking!